Bricks are the most common and useful building materials used for masonry construction works. To build a long lasting structure we should always use good quality bricks and other building materials. In our previous article, we have already discussed the types of bricks used in construction. Today we will discuss some important brick tests to determine the quality of bricks. The common brick tests performed on the field as well as in the laboratory are described below. This test is performed to determine the compressive strength of bricks. It is additionally known as crushing strength test of bricks. Normally, 5 samples of bricks are selected and transported to the laboratory for testing. A brick sample is kept on the crushing machine and then the pressure is thoroughly applied axially until it breaks. The maximum pressure at which the brick starts to crack is noted. The test is repeated with all 5 brick samples one by one and the average result is considered as the compressive strength or crushing strength of bricks. 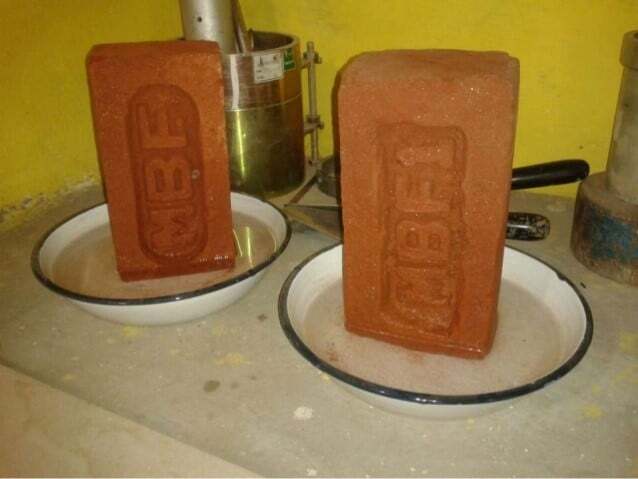 In this test, bricks are weighed first in dry condition (W1) and then they are fully submerged in water for 24 hours. After immersion of 24 hours, the bricks are collected and weighed again in wet condition (W2). The difference of weight between dry and wet condition is considered as the water absorbed by the bricks. Then the amount of water absorption is determined in percentage. The less water consumption by the bricks indicates their greater quality. A brick will be considered as good quality if it does not consume more than 20% water of its own weight. This test is carried out to obtain the presence of alkaline substances in bricks. First, bricks are fully submerged in fresh water for 24 hours. After 24 hours they are collected from water and left them to dry. After completely dried the bricks are closely observed to find the presence of alkali. If a white or gray layer is formed on the brick surface, it means alkali is present in the brick. In this test few bricks are dropped from 1-meter height. If bricks are broken it indicates low impact value and not acceptable for construction work. Good quality bricks do not break at all. 20 bricks are randomly collected and arranged in a straight line. This is done to see the variation of shape, size, and color with the standard bricks. In this test, two randomly selected bricks are hardly punched with each other. If they produce a clear metallic sound and remain unbroken then they are good quality bricks. This test is done to know the hardness of bricks. In this test, scratches are made on the surface of the brick by a hard thing. If it does not leave any impression on the brick surface then it will be considered as good quality bricks. In this test, a brick is fractured and firmly investigated. If any flaws, holes or cracks are seen inside the broken brick, then it is considered as poor quality brick. Very informative remind me my College Lab Days…. Its so amazing…students gets familiar with the all works like testing in job site so thay try to reach himself at that level.